← Two more sleeps to Christmas! Anyway, I’ve already told Mummy that I’m staying up past midnight and I don’t care how far past my bedtime that is. I’m looking forward to it for two reasons. Firstly, I want to see if 2013 looks any different to 2012. I’m hoping for pink elephants marching past. The second reason I’m looking forward to midnight is that I heard Mummy say once that if she wasn’t in bed before midnight then she would turn into a pumpkin. I wonder what shape she’ll turn out, I can’t decide whether to carve her or to make her into soup until then. Daddy spent the evening tracking Santa on the Internet so that we knew when exactly we had to go to bed. We knew he was getting close at around 8pm when an elf came to check the house. I heard the doorbell ring and I ran out into the hall to see if it was a visitor (preferably one bearing presents) but there was nobody there! I did find some little chocolate Santa’s though that had come through the letter box. When I got back into the sitting room Mummy explained what had happened. Santa’s elves were checking every house to make sure the chimneys were clear and that all the children had their socks ready. Mummy got to meet the elf! I was so disappointed, the elf was so sneaky to ring the doorbell to get me out of the room! 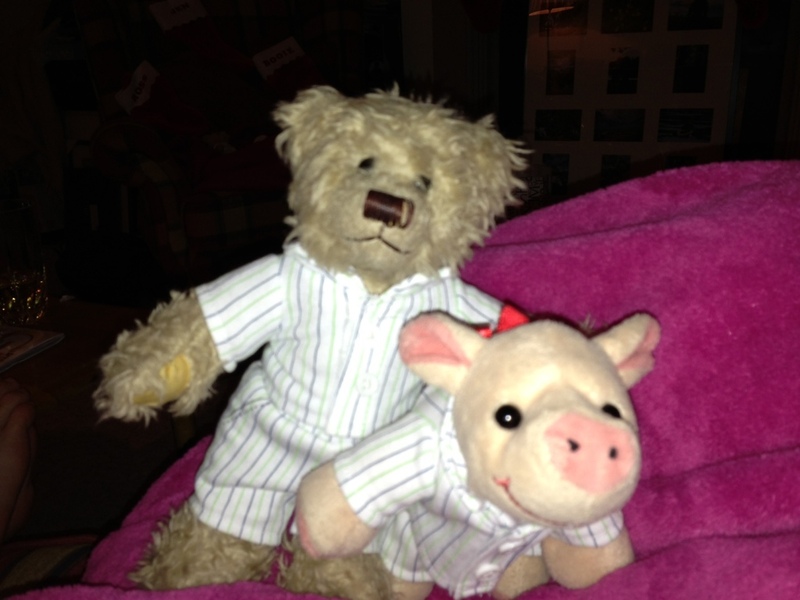 Before we went to bed we had to get a treat ready for Santa because he might be hungry after all his travelling. Also, I was hoping that if we put out nice things then I might get better presents… I got a bottle of a fizzy drink that my Mummy likes, she didn’t seem to be using it, and I also took some of her fancy chocolates when she wasn’t looking. 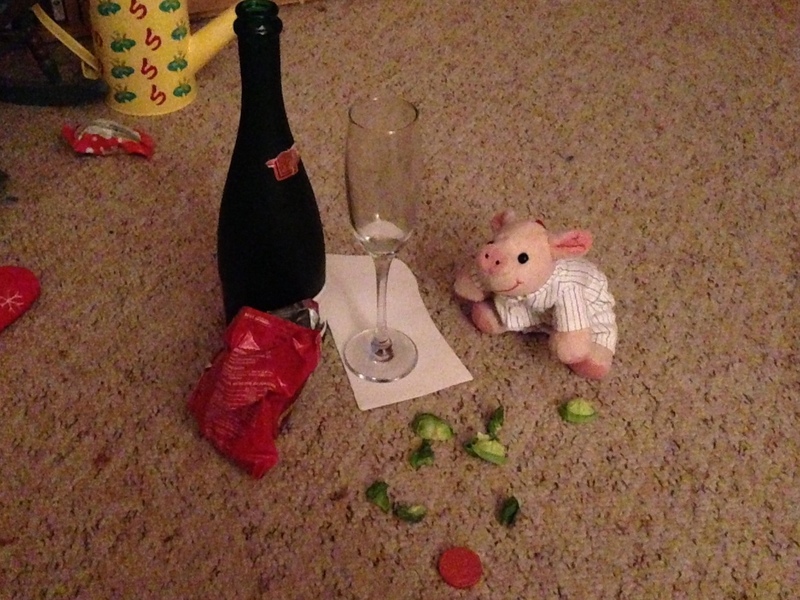 I tried to find some carrots for Rudolph but we only had Brussels Sprouts. I hate green things but I thought that maybe the reindeer might not mind. I was right, this is what we found when we came down in the morning. I got so many cool things in my sock! I got some puppets, lots of chocolate, a bag to carry my army supplies around in and a kit to excavate my own mammoth! But best of all, I got a whole bag of gold! It’s bigger than my head! 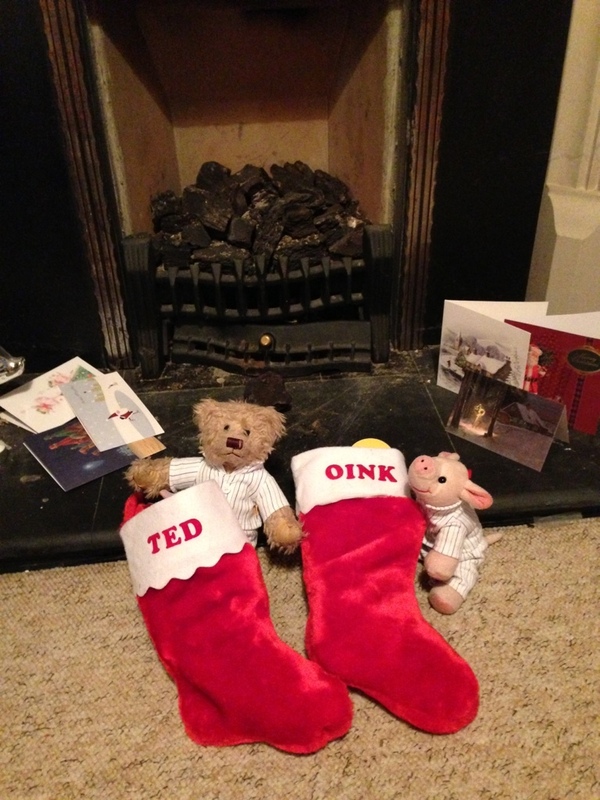 I was a bit disappointed that I didn’t get a submarine but I guess Santa got a bit confused about what type I wanted so he let me buy my own 🙂 Ted got lots of stuff too but he didn’t get any gold even though he was so goody two shoes all year! I can’t wait until next Christmas, I bet it will be even better! In the meantime, I’m counting down the days until my birthday in March. Now, back to pumpkin watch…. This entry was posted in Uncategorized and tagged bag of gold, Christmas, excavation kit, Santa. Bookmark the permalink.